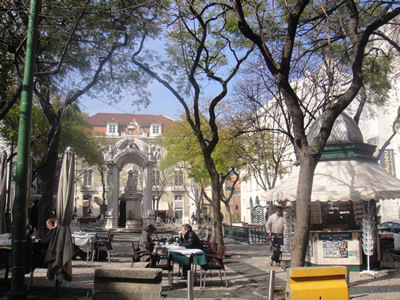 Wonderful Largo do Carmo is one of my favorite squares in Lisbon! Beautiful trees, historical buildings, fascinating church ruins, the extraordinary Santa Justa elevator and amazing city views! This picturesque square is very popular, well known for the terraces, in addition to being the scene of several shootings, both (science fiction) films or documentaries and commercials. Music and traditional dance are performed here during the summer. A unique fountain stands under trees right in the middle of the square. 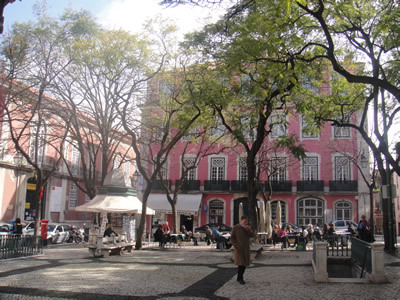 The Chafariz (fountain) do Carmo was built here in 1796. 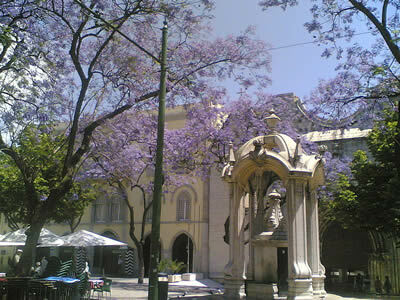 Largo do Carmo and blossoming jacarandas. Originally from South America, these beautiful trees of the Bignoniaceae family arrived in Lisbon in the mid-17th century and ever since, between May and June when they’re in flower, they have lovely bunches of lilac-toned petals. 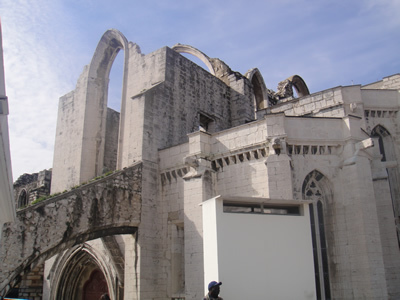 The headquarters of Carmo (Quartel do Carmo) is a very important building for Portugal’s history. 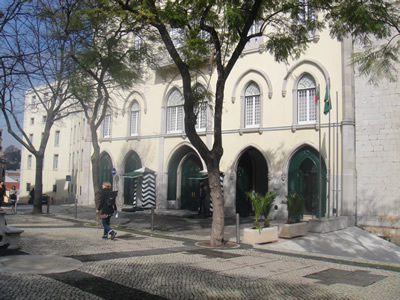 Marcelo Caetano (former dictator António de Oliveira Salazar’s replacer) found refuge in the main Lisbon military police station at the time of the revolution. 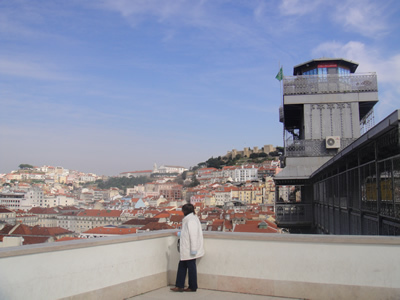 On April 25, 1974, the day of the Carnation Revolution, this building was surrounded by the MFA (Portuguese Armed Forces), which pressured Marcelo Caetano to cede power to general Spínola. It was here where the Estado Novo (New Regime) officially came to an end after almost 50 years. More.. 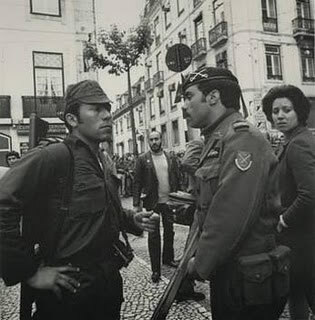 The Carnation Revolution was a largely bloodless coup. Remarkable: there were two secret signals in the military coup: first the airing of the song “E depois do adeus” (“And after the farewell”) by Paulo de Carvalho, Portugal’s entry in the 6th of April 1974 Eurovision Song Contest, which alerted the rebel captains and soldiers to begin the coup. Next, on April 25, 1974 at 12:15 am, the national radio broadcast Grândola, Vila Morena, a song by Zeca Afonso, a progressive folk singer forbidden on Portuguese radio at the time. This was the signal that the MFA gave to take over strategic points of power in the country and “announced” that the revolution had started. 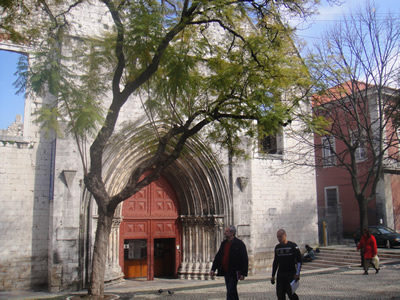 Here you can also find an entrance to the famous Archeological Museum, the gothic ruins of the 14th century Igreja (church) Convento do Carmo). Open from Monday- Saturday 10h – 18h, cheap entrance. 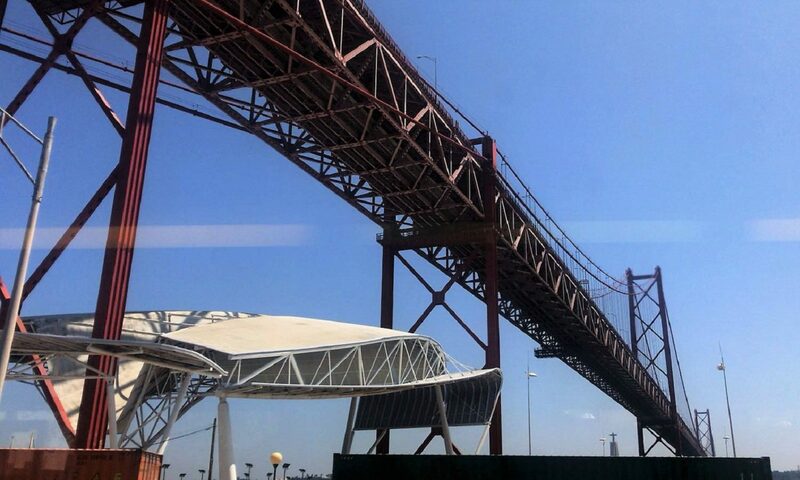 The construction of this monument started in 1389 by order of Nuno Álvares Pereira. The church was destroyed the first of November of 1755 by the horrible and well known earthquake. A lot of people died. More information.. 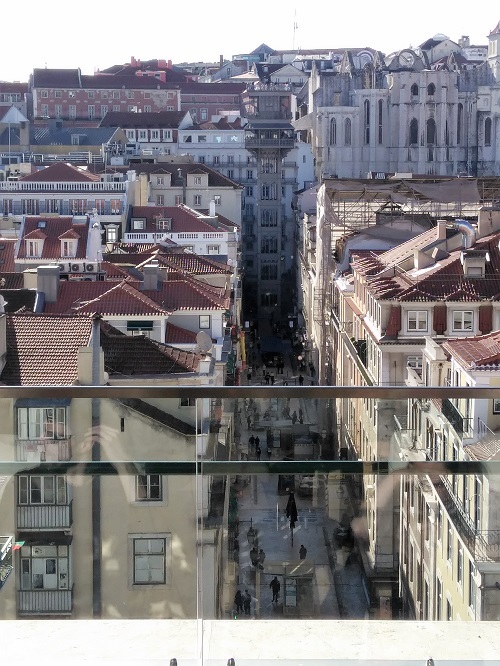 The famous tourist attraction ‘Santa Justa elevator’ (Elevador de Santa Justa video), Rua do Santa Gusta, built around 1900 to connect the Baixa and Chiado districts (around 32 m high), can bring you to the Carmo Square.